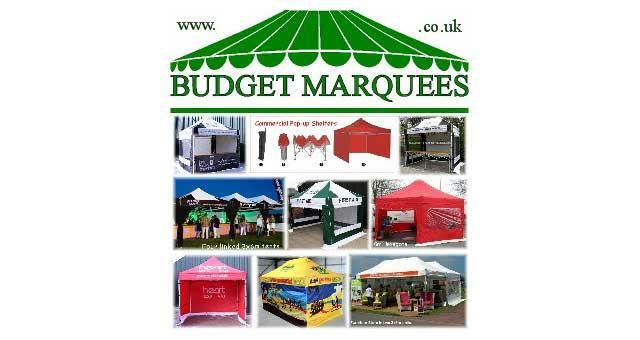 Budget Marquees01493 780874work Business SuppliesBUDGET MARQUEES is located in Great Yarmouth. Established in 2005, they are a supplier of branded Gazebo Event Tents (for sale, branded or plain) nationwide, and party-tents (for hire, locally up to 40 miles) and accessories to make your event a great success, whatever the weather. With a choice of 19 standard colours, three grades and 11 sizes of gazebo tents, plus printing facilities, customers can soon be out in the public eye, getting attention like never before! A branded gazebo is a powerful advertising tool! Quick and easy to set up and transport, any business, charity, club or team will find they can make new contacts, and show off their organisation with pride, almost instantly. With unrivalled warranties, the Elite model comes with 36 months on its frames, traders will feel confident inside in summer and winter. The Lite model is perfect for others regularly attending shows around the region, mostly branded with logo, website and names to promote their wares and increase their turnovers. Use your garden for your next family special event! There are four sizes of party-tent for hire to make your party go with a swing. Budget Marquees will deliver, set it all up, with tables, chairs and lighting, etc so all you need to do is invite all your friends along! Get involved with your local community too, on your village green; their marquees are perfect for local events. 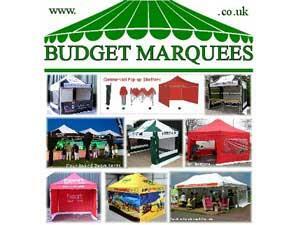 BUDGET MARQUEES is located in Great Yarmouth. Established in 2005, they are a supplier of branded Gazebo Event Tents (for sale, branded or plain) nationwide, and party-tents (for hire, locally up to 40 miles) and accessories to make your event a great success, whatever the weather.